First, Great job. I appreciate all that you have done and the hard work into this project. I have installed this on 2 different machines and I'm getting the same results. From the beginning the environment and character seems to be in slow motion. I have tried adjusting all the display setting to low and/or medium and nothing seems to help. Forgive me for being such a squid. I have done all I know how at this point. Will get into that in a sec but first try other things. also if I may add... I can look around nice and smoothly its just the movement of the interaction once I start walking and running and response to engaging the parts in the environment. It may fall in the same resolution you offered but I failed to mention that in my first post. That's because I've set up the pack to slow the game/game world down on in stead of stuttering. 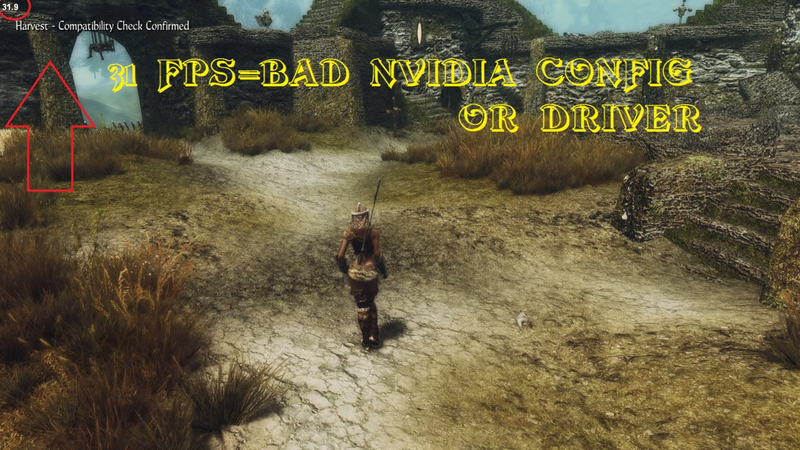 Skyrim tends to stutter on lower end CPU's or PC's, so it's your choice if you want the stutter or slowdown. What are you PC's specs? Sorry for the delay. I was traveling. Its weird because this same thing happens on my laptop I take with me on the road. I used your 2.0.5 before this and I did a clean wipe just so I didn't have any cross contamination. So I know it can work, I just might be overlooking something simple and stupid. Usually the case. My computer doesn't like Skyrim lol. Most places get 20-30 FPS, but I can play Witcher 3 on downsampling+hairworks fully on+max everything and that is vastly more intensive than Skyrim. Fallout 4 as well handles without any issue at all. But vanilla skyrim I also get 20-30 FPS...completely fresh install, but such terrible FPS. And I've always had such low fps and a lot of crashes in skyrim, even without mods installed (not installed at all on a completely new copy). I still have 1000+ hours of skyrim, but its only game I have that plays so badly. I bet its cause its a 32bit game, hence why Fallout 4 plays vastly better than Skyrim. And witcher 3 of course is a super intensive game and I play that without any issue at all, and I even downsample and that is even more intensive. No idea why skyrim plays so terrible. Its like the only game that hates my PC lol. And even going back to really old drivers doesn't help, it just makes my other games play worse. Even on a completely new OS install, skyrim still hates my computer. Still weird that vastly more intensive games play 1000x times better than skyrim. and of course fallout 4 plays vastly better too. like I said, I bet its cause its a 32bit game and that is where all the issues come from. Cause fallout 4 is an actual 64bit game and plays vastly better. Also that program to make a game use 64bit using hexcodes or whatever doesn't help at all, its more of a cheap hack and maybe it did give me a few fps and a tad more stability, but a game kinda needs to be built for 64bit (like fallout 4) to actually take full use of it. Oblivion plays better too btw, I can play oblivion with 1000+ mods, HUGE open cities, HUGE new lands all part of the same world, and it plays just fine. Not to mention the thousands and thousands of npcs and monsters added everywhere. Then again, it IS a much older game. But its more CPU intensive than skyrim with how I modded it and still plays better. I get 50-60 in oblivion with all the mods. Something must be bottlenecking Skyrim, but I don't see it in any other single game I play, even the very intensive ones like Witcher...and fallout 4 doesn't have this issue or any other game. Must be something I have that skyrim alone doesn't like. Not gonna worry too much about it though, it just gets annoying going to riverwood or other intensive places and fps drops to 20 and then I crash (but I don't crash if I look at the ground) lol. On top of that. In fallout 4 I spawned 50 brotherhood of steel and 120 super mutants...my fps was still over 30 and that was in middle of a crowded city with a ton of stuff going on. No idea why skyrim plays so badly for me, its one of my favorite games. But with mods, no mods...I get 20-30 fps in riverwood/falkreath and constant crashes when entering intensive areas, unless I look at the ground as I'm entering them then I don't get any crash. Its not your mod, its just skyrim itself that has so many issues. Cause like I said, even without a single mod file its the same exact thing. I thought upgrading my GPU would fix it, but it did give me a 30-40 fps increase in witcher 3 lol. And gave me 60+ fps in fallout 4. Not a single fps increase in Skyrim. Wonder why Skyrim plays so badly. I even tried deleting the inis (which I did on a fresh install, or it wouldn't be fresh :P) and all kinds of things. Spent so many posts asking people for help, so many drivers and new OS installs and everything. So weird. Unless skyrim is a lot more CPU intensive than witcher 3 and fallout 4...but even then, that wouldn't really explain crashes on a 100% pure vanilla game and 20-30 fps on my high end computer...when witcher 3 is the most intensive game I have and it plays wonderfully. And while fallout 4 isn't quite as intensive, it still plays wonderfully too. still enjoy skyrim so much. But its just always so annoying when I can't play it at all. I still have 1000+ hours, but it loses a bit of fun and challenge when I need to save every 5-10 minutes. To answer one of your questions our CPU's are very dated to keep up with the amount of mods used but none the less you should have 35+FPS in towns/villages, 50-60 FPS in the "wilds" and smooth 60 FPS indoors. I'll look at your new tips you have, see if that doesn't help any :) One thing I didn't do (I did watch your video on tweaks and stuff) is lower grass density to size 100, I bet that will help a lot in the outdoor areas. There looks to be a couple other things I can do too, maybe dropping resolution to 1680x1050 could help (my native res is 1920x1080)...I wouldn't want to drop it lower than that. And turning off ENB does actually gain me 10 FPS, but I kinda prefer it on :P Turning any of the effects like SSAO/DOF doesn't really do anything but get me 1-2 extra fps lol. They don't take much of the performance for me. •Don't forget to set your options like in the tutorial from Nvidia control panel. •For me if install any newer driver that the one mentioned before fps goes to 30 and remains there. •Assuming everything is installed correctly you should have no CTD could be bad load order? •Is your pack installed in X: and called exactly Skyrim ? •Does MO see 206 mods in the left pane and 192 in the right pane? •Are all your cores unparked? I can send you a small app that leave all your core always unparked. •What is a your script latency? I'll make two new videos about how to know your script latency and for tweaking ENB's in-game.I'll added them to the new video thread. And yeah, load order and everything is correct. It was all auto-done since I created drive x with a folder called "Skyrim". Only thing I changed was the water esps to lower on the load list as you suggested the other day, but actually, I noticed my CTDs increased after doing that, and pretty sure FPS actually went down. Not sure why, or if it was a coincidence or something or maybe I'm just imagining it lol. I dunno where they were before though or I'd put them back lol. Maybe I should copy over the mod list files again, unless you think the water esps are fine. And mine is actually 209 on the left, 192 on the right. I never added any mods though or changed the mod in anyway except for the water esps. I bet the high texture DLCs are the ones counted on the left, but they aren't active. I could probably delete them, but I just left them there as I figured leaving them not active is good enough. You should delete anything related to highresolution, both bsa and esp. So deleting the texture pack esps and bsms gave me a 3-5 FPS increase. Usually I delete them, but guess I forgot or something. Weird they'd give such a big increase in FPS even though I didn't activate them. Then I went from 25 fps to 30 fps minimum in riverwood, and then gained about another 5 fps when setting the grass to 100 in size. Afterwards before this post when I saw you updated, I made sure the nvidia settings were all correct, and one setting was actually wrong. The texture anisotropic sample one was set to on, but I see yours is supposed to be off. Dunno if that'll increase FPS further or not, as I'm going to play europa universalis the rest of the night. But doing all the other tweaks sure made a difference. 35 fps average in riverwood is vastly better than 25-30 average lol. It made skyrim have 10-15 FPS in menu screen, and skyrim was soooooooo laggy. I barely could alt tab delete out of it lol. I will be sure to make some guides for people who can only run the pack at 30FPS. Riverwood can be a little problematic because it uses some advanced textures that use a complicated 3d look for the wood and can add strain on the CPU. But as i've said anywhere in the wilds you should get 45-60 FPS with your PC setup. yeah did notice Riverwood looks pretty fancy. All i will be doing today is testing and tweaking ini's. Tomorrow or later this evening i will post and release different version of the tweaks for different people and computers so everyone can enjoy the pack at a decent framerate. I have this same problem, What is fix for this? Fps is "good" 50-60 but all in skyrim go like slow motion, Very weird? Oh thx, Its fix now!